The Cuisinart PTK-330GG is a perfectemp® 3-quart tea kettle that features built-in precision temperature gauge, providing exact water temperature to brew every variety of tea. It reduces unnecessary boiling or re-boiling. This tea kettle has Porcelain enamel exterior and interior with iron core that heats up quickly and retains heat well. The Perfectemp Teakettle - Graphite has many exciting features for users of all types. You can extend the lifetime of your Perfectemp Teakettle - Graphite with the purchase of a FactoryOutletStore Factory Protection Plan. 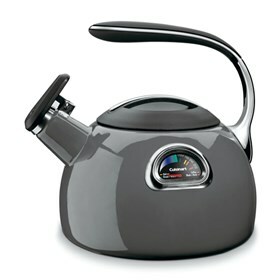 The Perfectemp Teakettle - Graphite is sold as a Brand New Unopened Item.